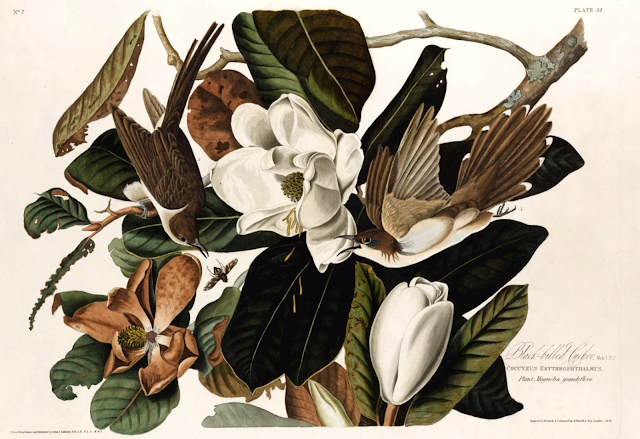 This plate illustrated Audubon's ability to fill the frame with drama and beauty, achieved here with the inclusion of the magnificent giant bloom of the Magnolia grandiflora. The Black-billed Cuckoo pictured here were not captured "on one of these trees, but in a swamp near some, where the birds were in pursuit of such flies as you see figured, probably to amuse themselves." This image (Plate 32) was published life-size in Audubon's first edition magisterial "The birds of America", where the scale and the subtle tones of aquatint etching emphasised both the perils and vigour of nature.